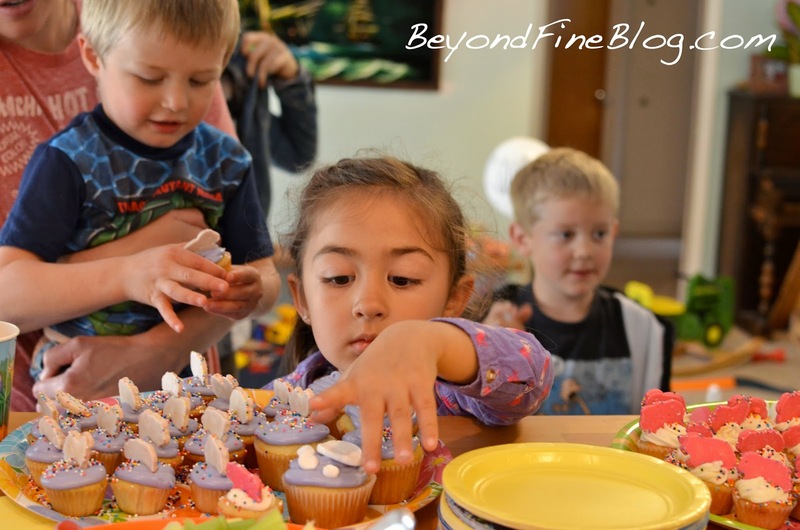 BEYOND FINE: Lydia's Animal Party! 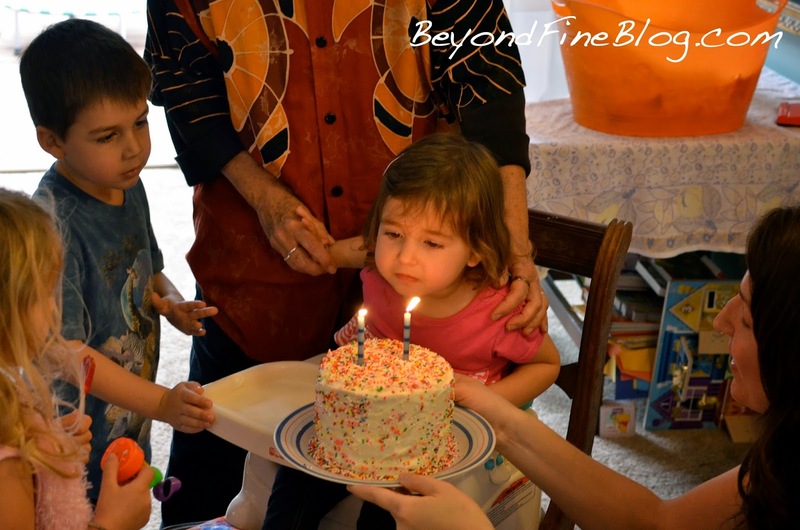 Lydia turned two! 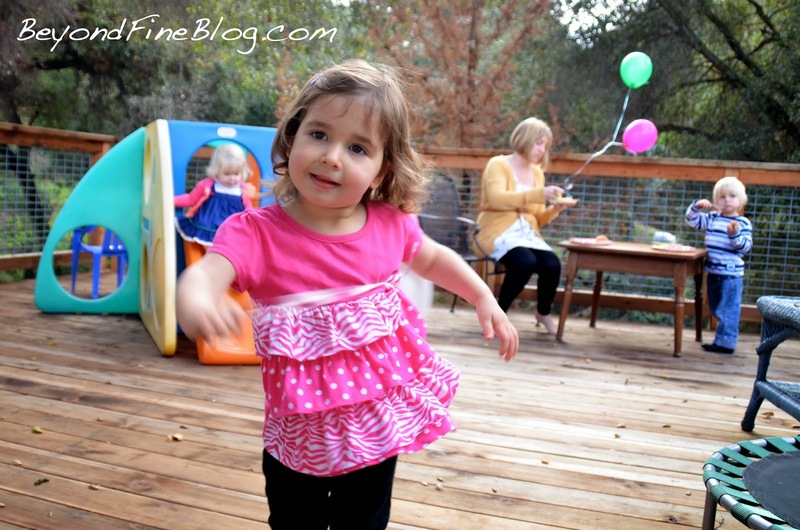 So we threw our little animal lover an animal party! 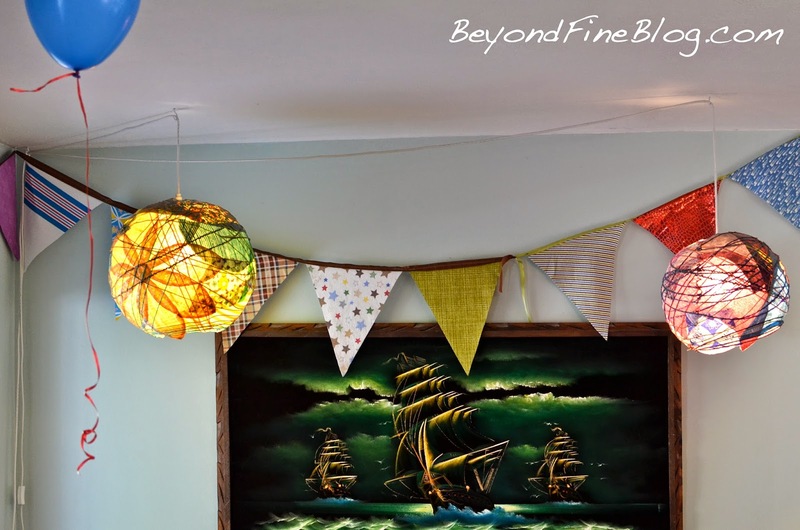 Everyone had a blast, and I wanted to share the details of our decorations and craft projects. Maybe they will inspire someone else! 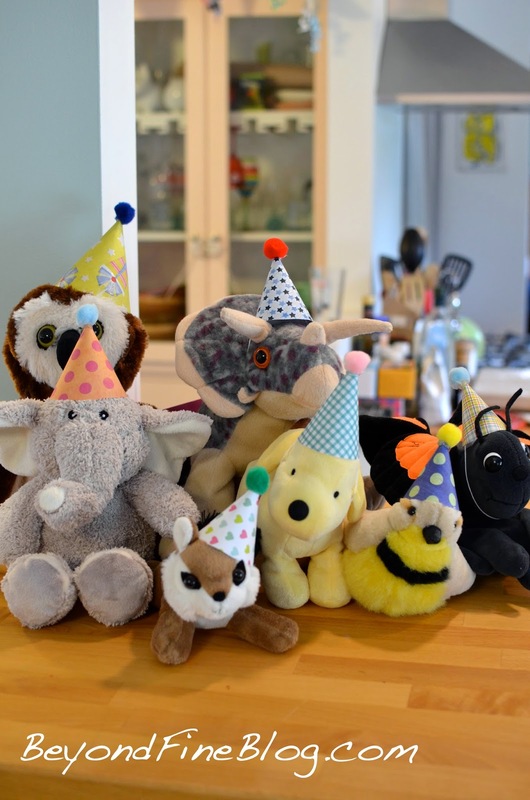 Along with all our awesome friends, Everett and Lydia's "stuffies" were invited to the party! 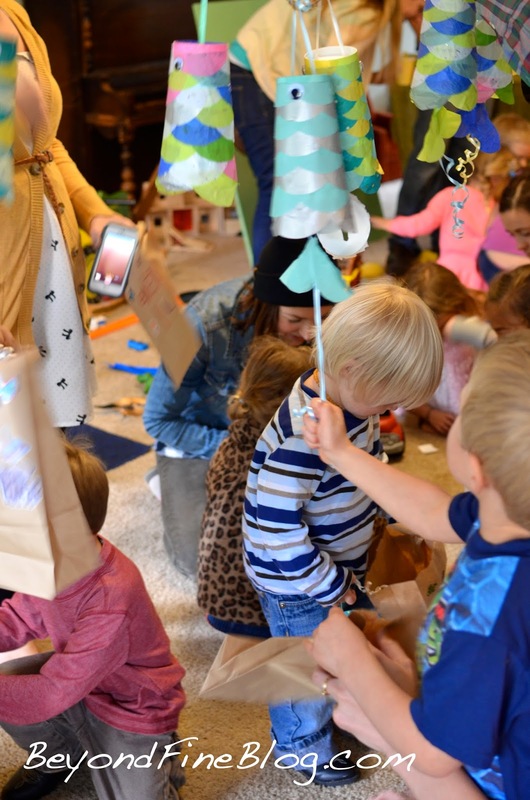 It was quite quick and easy to make party hats for them using half circles of scrapbook paper taped into cones. I hot glued pom poms to the tops and taped the hats on the animals with twine (taped the twine to the insides of the hats). We also decorated with our flags and balloons. The kids love balloons (of course). I usually buy a small helium tank at Michael's using a 50% off coupon. Everett thought his pirate party could have used more traditional party games and activities (a treasure hunt alone didn't cut it! ), so I planned some "classic" party fun. 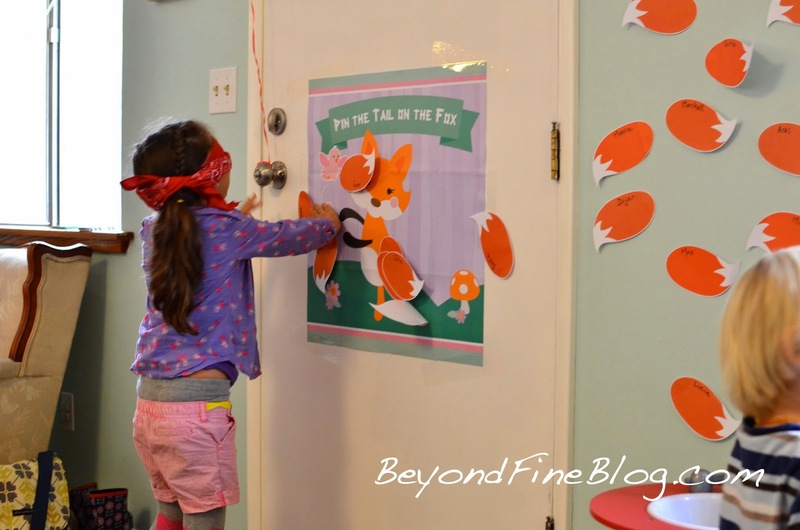 We played pin the tail on the fox! 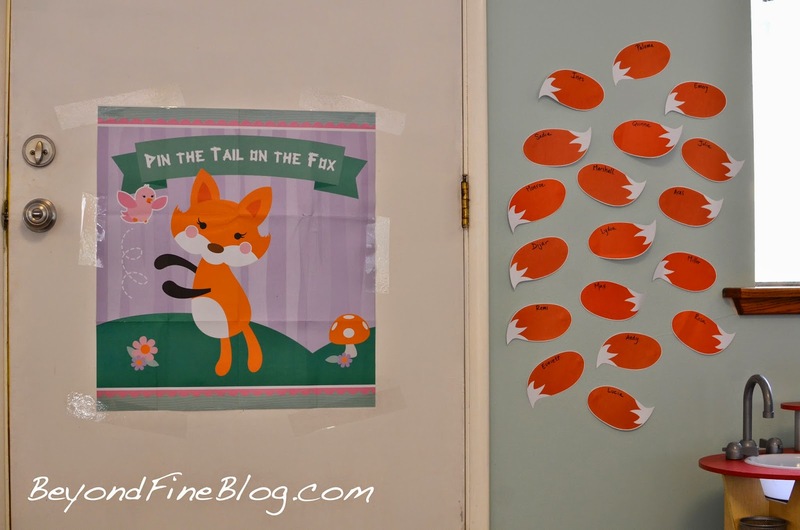 I thought about making my own, but the price of pin the tail games on Oriental Trading Company is unbeatable, $3.99! I had to get more tails copied onto card stock because the set only came with 8. I used 3M putty to attach the tails to the wall and then to the game. It's funny how some kids were excited to participate and others just wanted to watch, maybe half and half. But everyone had fun! 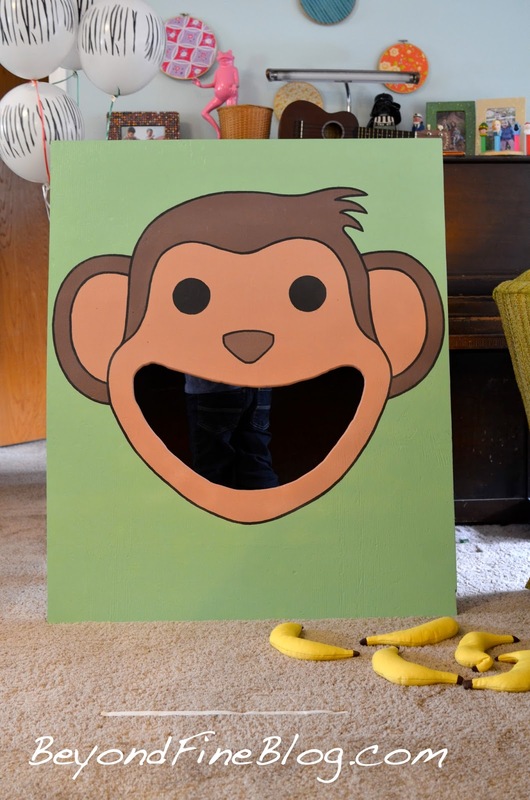 A monkey/banana beanbag toss! I sewed the wonky bananas using thick yellow cotton, filled them with rice, and painted the ends brown. I put tape on the carpet every 2 feet. We didn't lead a game. The kids did their own thing, and I saw some tossing beanbags and having a good time. Brian helped a lot with this project. He cut the plywood and designed and built the stand (two strips of plywood attached with hinges). 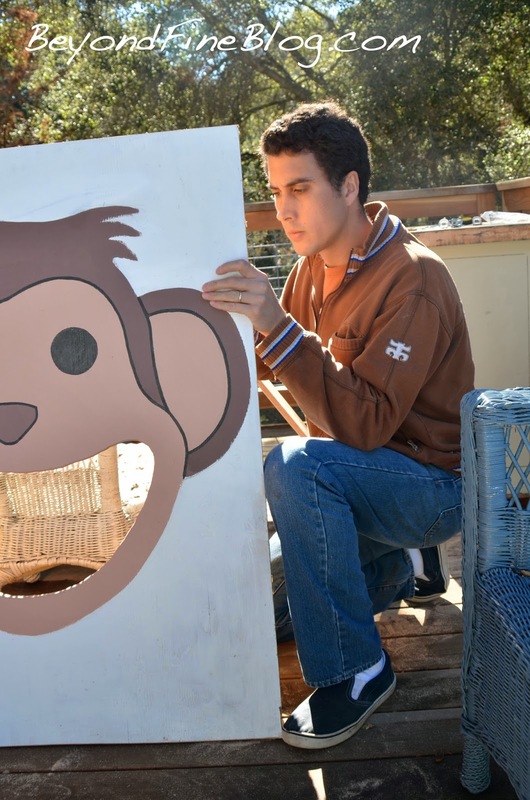 I painted the monkey with acrylic paints, leftover house paint and craft paint. 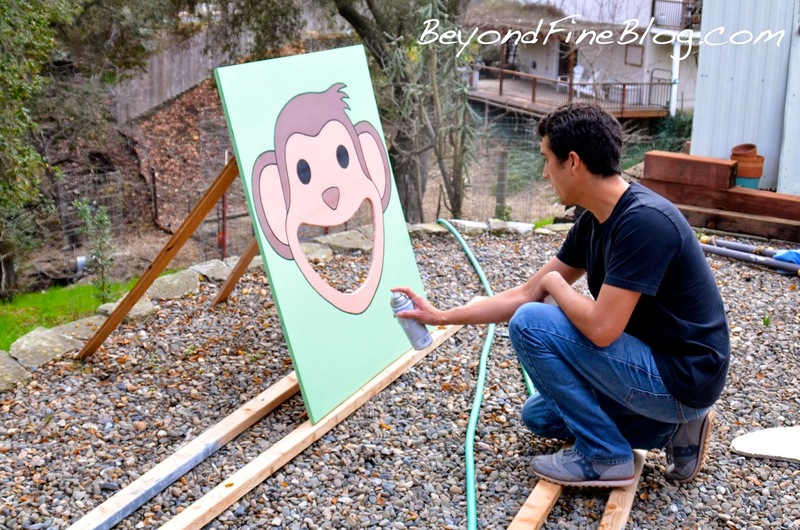 We sprayed it with clear matte spray paint for protection and to even out the different sheens of the paints. 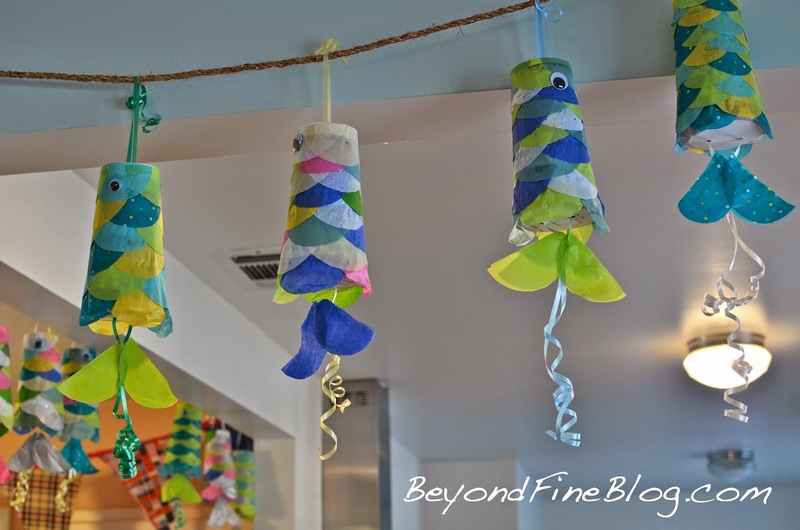 Since it was a two-year-old's birthday with lots of little kids, and I'm not a big fan of traditional piñatas anyway, I thought it would be nice to do individual pull-string piñatas. It was a bonus that they were great decorations! But I bit off a tad more than I could chew with this project. There were lots of little steps, and it was very time consuming. 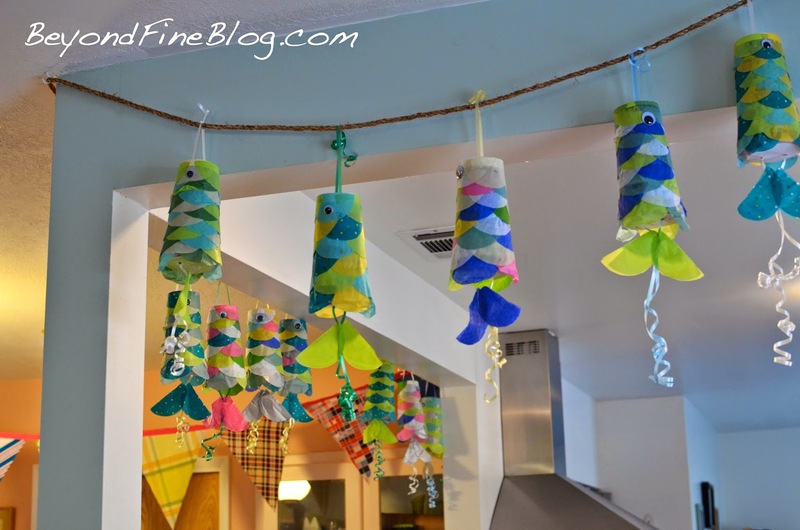 I'm not going to say I regret making the fish piñatas (they really did look awesome), but I will try to avoid projects like this in the future. In our collage box I found a deck of animal flashcards (pretty thick card stock). 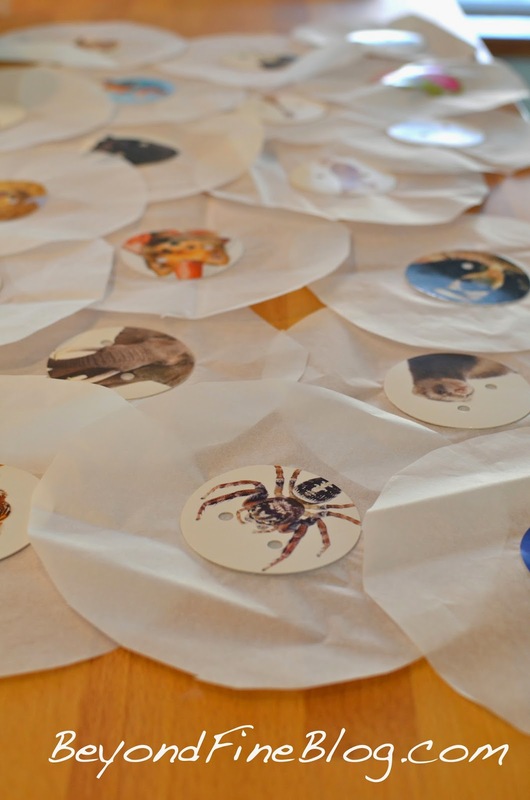 I cut the animals out in circles and punched two holes in each. I glued these circles on larger tissue paper circles. 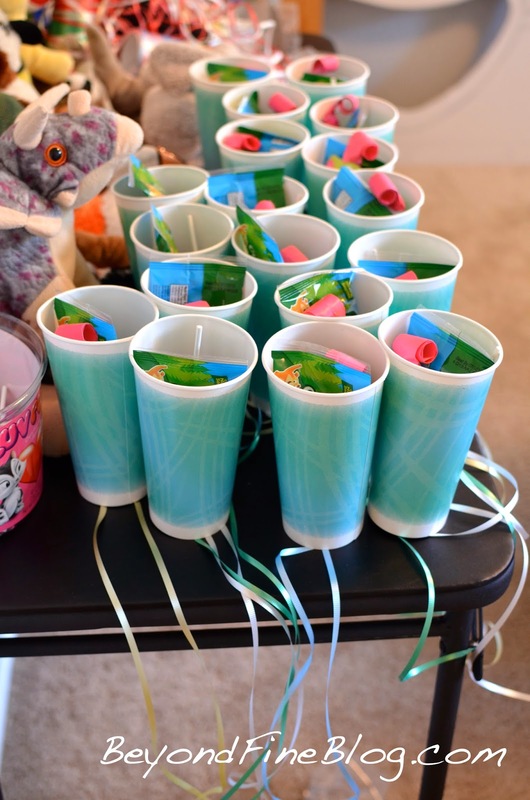 I poked holes in the bottom of large drink cups and strung ribbon through. I'd recommend tying a knot at whatever point makes sense to you. You don't want the ribbon coming out. We (Everett helped) filled the cups with gummy bears, suckers with a dog and cat on the wrapper, butterfly party horns, animal stickers, tattoos, stamps, finger puppets, and probably some other stuff. I strung ribbon through the circles (again, tie a knot) and packing-taped the tissue paper circle to the cup. 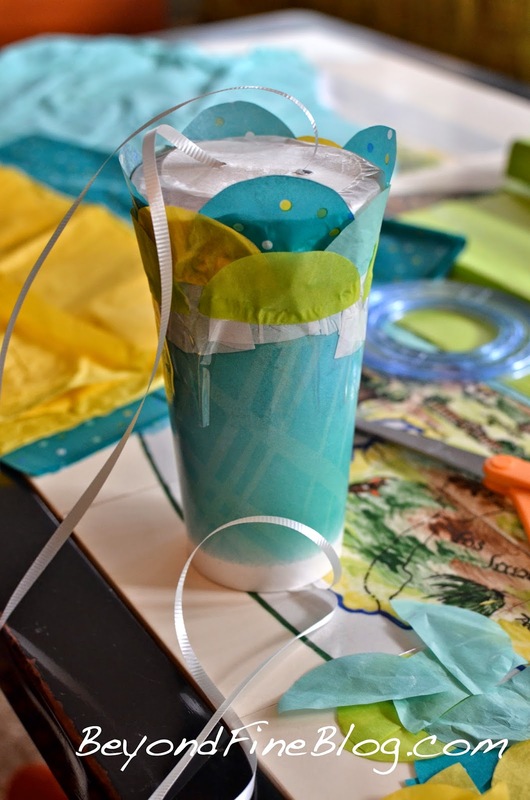 After a test run, I found out the tissue was too strong (the ribbon ripped through the cardboard circle instead of detaching the circle from the cup). So I made little cuts with an x-acto knife around the circle, perforated the tissue basically. To make the scales, I cut circles of tissue (in as thick a stack as possible) and then cut the circles in half. Starting from the opening of the cup, going around and down, I attached the scales with white glue. I spaced out the scales as far as possible to save time and materials. I tied my knots close to the openings and glued the tails over the knots. The tails were four scales made into a "V." Two "V's" glued together. I curled all the ribbon. 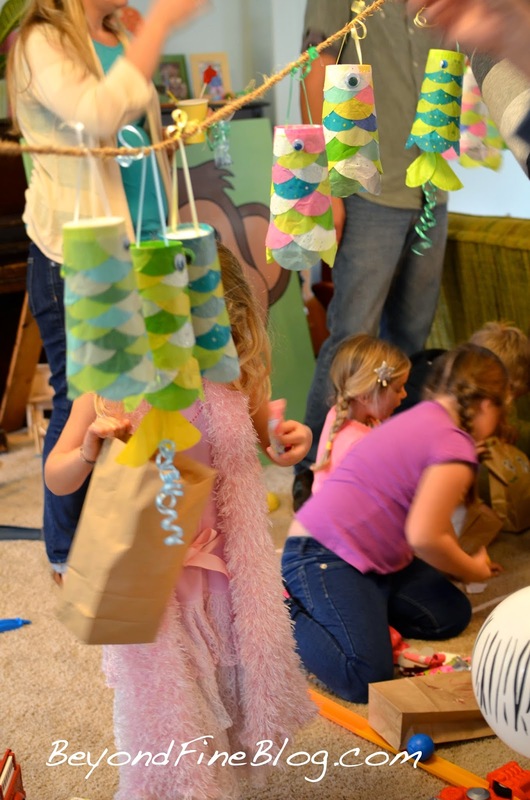 I had envisioned having the kids open the piñatas one at a time, so they could collect all their loot individually. But Brian convinced me that 16 or so kids going one at a time would take too long. One adult stood at one end of the rope and another stood at the other end, and all the kids went together. Some of the bigger kids rushed to get as much as they could off the floor, but the little kids seemed happy with the stuff they collected, and they all got to pull their own piñata! 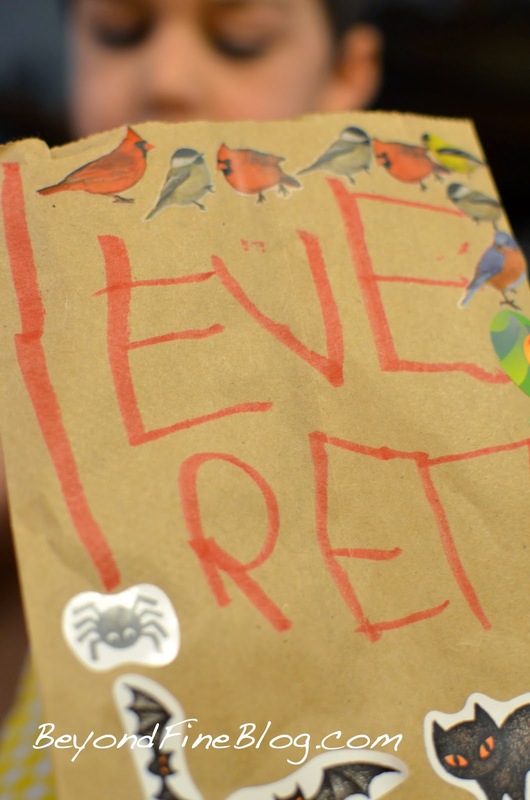 I had Everett write the kids' names on brown paper lunch bags (to hold the piñata goodies) and decorate them with animal stickers. 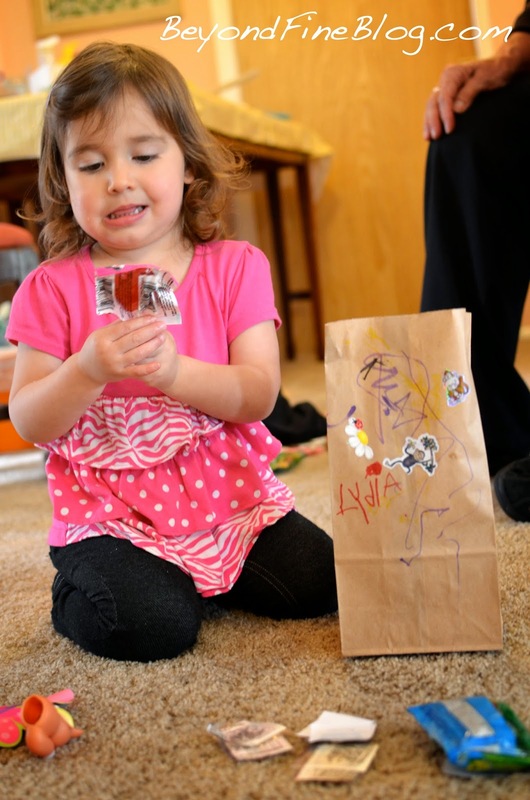 As you can see, Lydia decorated her own. 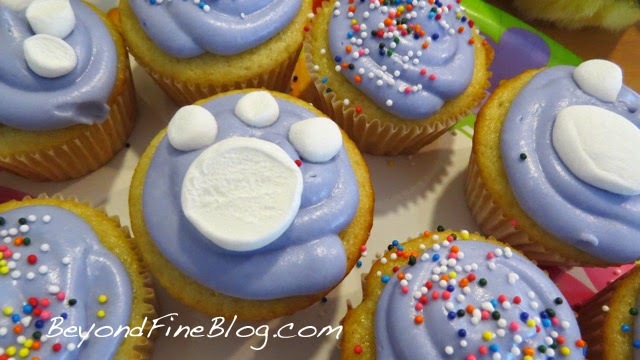 Just some fun/easy Pinterest ideas. 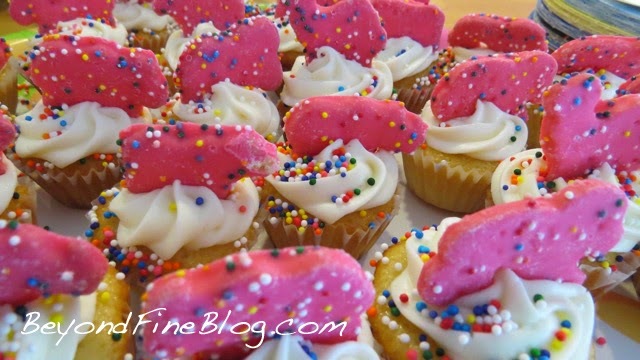 Vanilla cupcakes, cream cheese frosting, circus animal cookies, marshmallows, and sprinkles make everything more fun! I even did the sprinkle cake thing for Lydia. 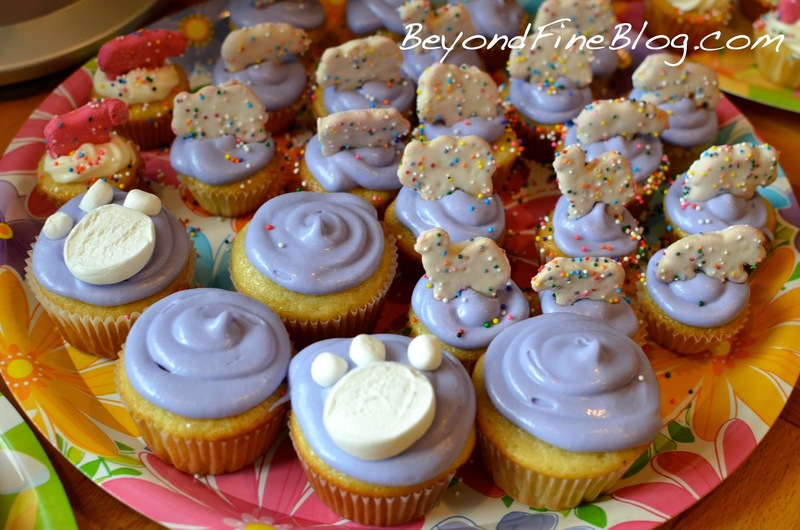 Sprinkles everywhere!! I didn't take a single picture of the delicious turkey chili my father-in-law made. 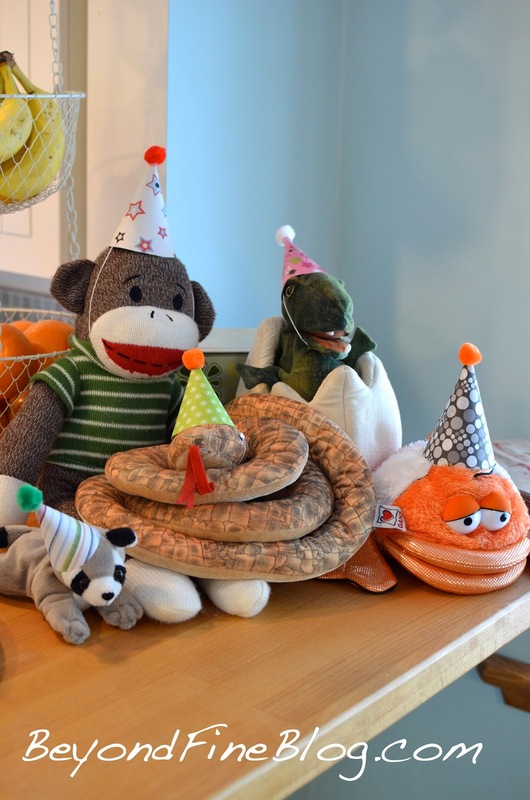 We had chili dogs--hot dogs for an animal party, right?! And all the salads and sides my parents and in-laws made. Oh well. Imagine delicious food. We're always so grateful for their help at our kids' parties. That was a lot of fun! Thank you for reading!